What Exactly is a Toddler Tantrum? Several years ago NPR had a story about temper tantrums, describing a study showing that the sounds children make during a tantrum indicate that they are primarily sad rather than angry. The written version of the story opens with description of tantrums as " the cause of profound helplessness among parents." I thought this was an interesting choice of words, as I have always thought of tantrums as representing a sense of helplessness in children. In fact, in my over 20 years of practicing pediatrics I have told parents that, for the most part, tantrums are a normal healthy phenomenon. They occur when young children emerge for a stage of omnipotence in the first year to recognize that they are relatively powerless. An excerpt from my book describes the phenomenon. Imagine that your toddler sets his sight on your glasses and declares proudly, “mine.” In an appropriate way, you might calmly say, “No, those are Mommy’s. I need them to see.” Suddenly he is confronted with the fact of his relative smallness and powerlessness. If he happens to be in a particularly vulnerable state, such as before lunch or naptime, he might become enraged that you, his beloved mother, have burst the bubble of his omnipotence. Unable to contain his intense feelings, he might lash out and hit you. The NPR piece got me thinking that we often describe children's behavior in negative terms, which immediately sets up a relationship of antagonism and confrontation. A colleague of mine, Suzanne Zeedyk, wisely has suggested that we reframe "challenging" behavior as "stressed" behavior. Then the language itself puts us in a position to empathize with the child's perspective. The word"defiant" is a perfect example of this negative language. That word(as well as "tantrums") is actually in the title of my book Keeping Your Child in Mind: Overcoming Defiance, Tantrums and other Everyday Behavior Problems by Seeing the World Through Your Child's Eyes. The first part of the title was my doing, as it comes from an important concept in contemporary developmental science. The subtitle was my publisher's doing, but I understand why it was chosen, as this is a common language. Perhaps, however, it is time to rethink that language. I was once asked to do an email interview for a parenting blog about defiance. The interviewer also used the word "impudence," another highly negative word. I suggested that this word projects intentions onto the child that are likely not there. In fact, "defiant" behavior almost always has its origins in a feeling of being out of control. From the child's perspective, his experience is not being recognized or understood. In a way he is not "seen." Herein lies the explanation of why defiance pushes our buttons. In a sense a parent is having exactly the same experience as the child. He or she is not being "seen" or recognized as an adult deserving of respect. A parent might have had other experiences of not being "seen,” perhaps by a spouse, co-worker or by her own parents, that makes her particularly vulnerable to getting upset about not being “seen” by her child. In almost every instance of “defiant" behavior, if one digs a bit below the surface, there is a way the child is also not being seen, or a way in which her experience is not recognized. 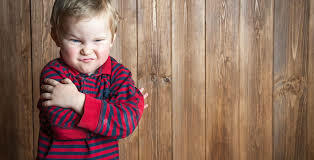 For a particularly dramatic example, a six-year-old was brought to my practice with a chief complaint of “defiant behavior”. Further history revealed significant trauma in the child’s life. An alcoholic father who had abandoned the child as a toddler had recently been making visits, at which time he was often drunk and very loud. Yet her feelings about visits had not been discussed until they came to see me for “defiant” behavior,” which was worse around bedtime. This child began sleeping all night in her bed after a couple of visits with me. We discussed this experience, recognizing her need for her mother's company at bedtime for stories, comfort and reassurance. Once a child feels that he is being seen, that his experience is recognized and understood, the "difficult" behavior often evaporates. In general, if there is increasing “defiance” it is important to take a step back and try to understand what feels out of control for the child. It might be that he is very sensitive to loud noises or taste, and battles around "making a scene” at a family outing or being “picky eater” are related to these sensory sensitivities. It might be that there is a new baby and everyone is chronically sleep deprived. Or there may be financial stress or marital conflict. Simply recognizing that these things are difficult for a child and acknowledging his experience, even if the stressors are still there, goes a long way in having a child feel understood, and in turn decreasing “defiant” behavior. Limits on behavior are essential, and my book goes on to say that the above toddler must be taught that hitting is never OK. But understanding, empathy and managing our own distress are all equally important. Reframing "difficult" behavior as "stressed" behavior is an important first step. Please note: This piece is cross-posted to Child in Mind, my blog on Psychology Today. It's also been published on my website. Great article, Claudia. Thank you.